Obituary for Norvin Ruford Hurt | Butler Funeral Home, Inc.
Norvin Ruford Hurt age 90 of Edmonton passed away Saturday, March 24, 2018 at his home. 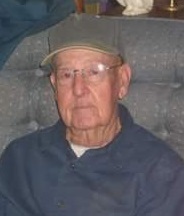 He was the son of the late Ruford and Virgie Howell Hurt. Norvin was retired from the Metcalfe County Road Department. Funeral services will be held 1:00 PM Tuesday at Butler Funeral Home in Edmonton with burial in the Metcalfe County Memorial Gardens. Visitation will be from 5:00 PM until 8:00 PM Monday and after 9:00 AM Tuesday at the funeral home. He is survived by his son Gail Hurt and wife Debbie of Edmonton. Two grandchildren. Danny and wife Kathy Hurt of Edmonton. Sandy and husband Alex Roberts of Edmonton. Five great grandchildren. Jesse (Katy) Hurt, Makayla Hurt, Raelynn Roberts, Kali Mann and Alana Sexton. Two great great grandchildren Waylon and Whitley Hurt. One sister also survives. Virginia Bailey of Glasgow. Besides his parents he was preceded in death by his wife Mable Ruth Hurt and a great great grandson Grayson Hurt.